My students have drawn me into later and later hours at school. For years, I was known for exiting the building at exactly 3:30 PM, yelling, “I don’t do overtime” as I neared the front door. With the exception of Tuesday’s tutoring sessions, that schedule was as regular as my penchant for waking up at 4:00 AM to grade more work. My students knew I was always good for lunchtime visits. But at my new school, lunch is shorter and more controlled. Access to my classroom is difficult to maneuver. I missed the easy in-and-out flow of prior years and started staying late to get it back. Last week, two young men came to visit after school. Light banter soon faded when the subject of father’s came up. “So, you in the ‘Deadbeat Dad’ club too?” one sophomore asked. “Join the party,” said another, offering a fist bump to seal the link. “My father might have left me,” I said, “but I never left my children. You can choose your own fate.” The two young men burst into a chorus of “You got that right” and excitedly shared their visions of future families. No “baby mama’s” here, they vowed, but loving wives and devoted offspring. It was nice to feel their enthusiasm, and I found myself wondering how much had been spurred by the detour I had taken in the day’s earlier lesson. I was not in the best of moods. As I returned what I considered to be an easy assignment, I noted the lack of effort I found in most of their work. I had asked them to write a letter from one character in a story we had finished to another. We had been discussing point-of-view, and I wanted them to assume the voice and manner of someone other than the protagonist. The only restriction revolved around plot; they had to honor the storyline as it was written, but they were free to extend it however they wished. The tenth grade students looked at me with confused faces. I could tell they did not understand my complaint. They had completed the homework; what else did I want? I paused, lowered my head into my hand, and then looked at them with a kinder face. “You know why I became a teacher?” I asked. “You couldn’t find a better job?” the sarcastic girl near the window asked. The class laughed, and the tension lifted. “I have you know I am an educated mind. Educated minds can always find a better job,” I said. “I know, I looked.” At that, the students roared, and I had them where I wanted. “A hamstring tear,” said the football player in the leg brace. “Yes,” I continued. “All those things–and more. 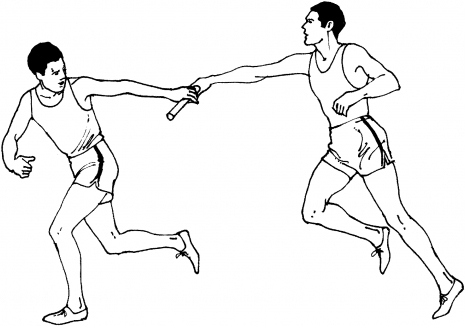 See, to me, life is like that relay race. That first runner, the one who started the race, I see as my ancestors, the ones I know like the grandparents, and the ones I don’t, like maybe the first African to touch these shores. I like to imagine them rounding the curves in that race and pressing forward despite all the obstacles along the way. How many of you have grandparents still living?” I asked. The students grew silent then, and I had one of those “pin drop” moments I live for. “The second runner, the one right before me, represents my parents. It is a race for two, my mother and my father. While they labor, it is my job to prepare myself for the race to come. In the distance, somewhere ahead of me, my children and my children’s children are waiting. Can you see that?” I asked, pointing to an invisible hill in the distance. Many nodded, and I continued. “You could root for your parents,” one boy added. “I feel you,” said the boy who came to fist pump me after school. “Carpe who?” a student asked. “It means ‘one monkey don’t stop no show,'” said the after school boy. “Nice,” the football player added. Then they did something they had not yet done all year. They clapped. So much for finding a better job. This entry was posted in Uncategorized and tagged carpe diem, deadbeat dad, passing the baton, teacher as coach. Bookmark the permalink.